"Physical therapy is not a subspecialty of the medical profession and physical therapists are not medical doctors; we are a separate profession that provides a unique service that physicians are unable and untrained to provide." The new ICF Browser is an exciting tool. I'm not kidding. The new International Classification of Functioning (ICF) Browser has the capability to specify exactly what physical therapists do and how we work on patients. Today I evaluated a 50-year old female office worker before lunch. She had tried to lift a heavy piece of furniture five days ago and developed sudden-onset right lower back pain. She presented today with a lateral shift in standing, positive right sciatic tension test, good (>35 degrees) hip external rotation, negative Gower's sign and a stiff back (P/A). She was in no apparent distress (low fear-avoidance) and had no prior episodes of lateral shift. Should I classify her in a manipulation or a stabilization group? Are the two groups mutually exclusive? Anyway, I have started using the new ICF Browser to classify my patients according to my findings. I have begun to avoid diagnostic labels altogether. The physical therapy diagnostic process has more potential to inform physical therapist decision-making than does classification with diagnostic labels. I will primarily address the loss of function: impairments in strength, endurance and mobility (ROM) in outpatient physical therapy. Note how the link between the measured activity limitation is the physical therapist's diagnosis. Treat the findings and don't worry about the label. Re-measure the findings (activity limitations and impairments) to assess success. Every physical therapist should be comfortable making a functional diagnosis. I stumbled upon your blog today and I am glad I did. I really enjoyed this idea on using the ICF model. I am curious about what you would put for diagnosis for a Medicare patient's paperwork if you are really going through with this process as you have indicated? Thanks and keep up the great work. Diagnosis descriptors are currently a hot topic in physical therapy with labels such as 'Loss of joint mobility associated with hypertrophic scar' which is then expected to improve decision making and direct treatment selection. I find labels long and confusing - I rely of the ICF Activity and Participation domain to state the patient's complaint and list the impairments in keeping with Body Structure and Function limitations. Interestingly, pain is listed as a Body Function limitation which I can then treat alongside ROM, strength and other impairment-level limitations. - weak deep cervical flexor muscles. BTW, I use classification predictor variables to show Medical Necessity and Skilled Physical Therapy for Medicare compliance. This site for those people who wanna do phd in history online yes online now you can get evrything online regarding phd. Thanks for an interesting reading! Also, wanted to share some physical therapy personal statement examples that might be helpful for those who are applying. Best of luck with admissions! You will do great! This blog is provide so informative information. It’s important when you write ATS. It’s really so helpful. If you don’t belief me then you can visit this site for your confirmation. It’s help you too. To be a good physician you have to work hard in your medical college with the consulting of better books to prepare for the exams. You have to make writing a statement of purpose for grad school so that you can make or create the skills in this medical field with hard work or dedication. I must say that you select the perfect occupation and I am sure you are experienced in this field and I want to say that keep your expectation high with aerospace engineering personal statement that one day you will become the top physical therapist of the country. Just keep doing hardworking. This time you give the information about the body fitness. Everybody should give some time to their body and it is very important to maintain the health physically with uc applications personal statement that is good. God give you the good talent and I must say that you utilize your skills in good ways. Tim Richardson, PT owns a private practice at Medical Arts Rehabilitation, Inc in Palmetto, Florida. The clinic website is at MedicalArtsRehab.com. 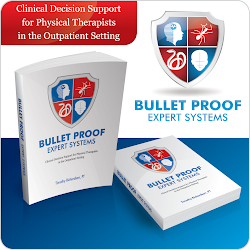 Bulletproof Expert Systems: Clinical Decision Support for Physical Therapists in the Outpatient Setting is a manager's workbook with stories, checklists, charts, graphs, tables, and templates describing how you can use paper-based or computerized tools to improve your clinic's Medicare compliance, process adherence and patient outcomes. Tim has implemented a computerized Clinical Decision Support (CDS) system in his clinic since 2006 that serves as a Reminder, Alerting, Prompting and Predicting CDS using evidence-based tests and measures. Copyright 2007-2010 by Tim Richardson, PT. Share PTD with your Peers! Consistent with the American Physical Therapy Association Vision Statement for Physical Therapy 2020, the American Physical Therapy Association supports exclusive physical therapist ownership and operation of physical therapy services. 40% off the retailers' price! Do doctors of physical therapy need to call themselves 'Doctor'? What's So Bad about Physical Therapy Documentation? Copyright 2007-2013 by Tim Richardson, PT. Powered by Blogger.